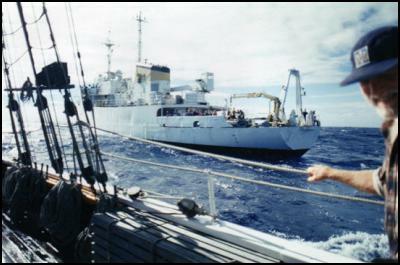 Back in 1995 during an interview on the TV Programme 60 Minutes, David McTaggart, Greenpeace anti-nuclear campaigner invited New Zealanders to join him in a peace flotilla at Mururoa. 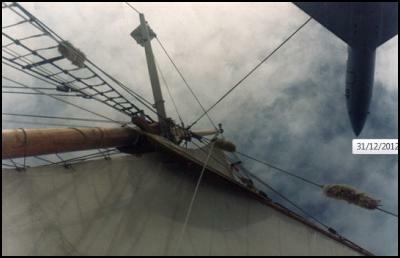 Northland’s iconic tall ship the R. Tucker Thompson, was one of the vessels that responded to that invitation. Now, 17 years later, the new state of the art Rainbow Warrior III is visiting New Zealand for the first time and visiting Matauri Bay, resting place of the original Rainbow Warrior. To mark this event, the R. Tucker Thompson will be joining them on 9th January 2013 to their return to the site of the original ship and offering a special sailing down the coast. Transport will be provided for passengers from Opua wharf up to Matauri at 1000 am where passengers will first visit the Rainbow Warrior memorial created by world renowned local artist Chris Booth and after lunch on board, to visit her resting place in the water off the beautiful Cavalli Islands. After paying respects, the ship will sail back down the coast with some of the original crew from the Peace Flotilla that went to Mururoa, with reminiscing and storytelling on board. The traditional Tucker afternoon cream tea of scones and jam will be served en route as the ship takes in the stunning scenery off the Northland Coast. The ship will be rounding Cape Wiwiki at the entrance to the Bay of Islands around 6 pm. Return will be to Opua Wharf around 8.30 pm, winds and weather permitting.